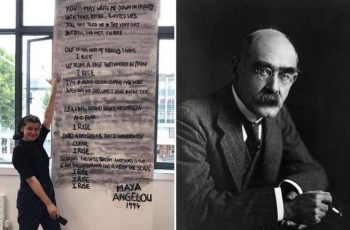 I’m sure LBC’s shock jock Nick Ferrari, could not contain his delight in reading the news that a student had defaced a poem at her college by the revered and venerable English literary giant, Rudyard Kipling. Ferrari makes a handsome living by stirring up binary conflict from the starting point of everything British is good, and everything foreign is well... you get the picture. His wide audience lap it up, because it feeds into a sense of lost glorious identity, predicated on imperial white supremacy, that ironically did nothing for the working class either, and blaming ‘the other’ for today’s ills. And so the cul-de-sac discussion goes on: demonising the young student; defending the indefensible; and missing a genuine opportunity to have a conversation about how we review our relationship with ‘great’ writers, politicians, business leaders who were consumed in a racial imperialistic endeavour that had the most catastrophic consequences for millions of people of colour. Sara Khan, we pay tribute to you. I hope you’ve got some support over the days and weeks ahead. You will have almost certainly realised that your actions have unleashed the bigoted dogs of hell, who will threaten and abuse in equal measure.